Roland Deschain and his ka-tet–Jake, Susannah, Eddie, and Oy, the billy-bumbler–encounter a ferocious storm just after crossing the River Whye on their way to the Outer Baronies. As they shelter from the howling gale, Roland tells his friends not just one strange story but two . . . and in so doing, casts new light on his own troubled past. The best way to describe this book is like a matryoshka doll, a Russian nesting doll. On the outside, you have the frame story of the ka-tet. Then you go a layer deeper to a story of Roland’s youth. Finally, you get to The Wind Through the Keyhole, the story at the heart of this novel. I’m glad I didn’t read this book while going through the original seven books of The Dark Tower series. It doesn’t really add anything to the series, it’s more of an enjoyable side book when you start missing Mid-world, but don’t want to commit to re-reading the entire series. 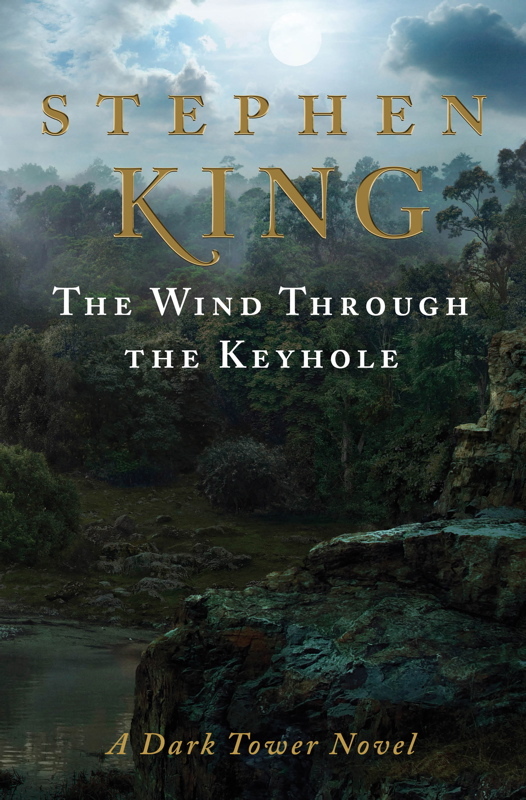 I thought the center story of The Wind Through the Keyhole was really a wonderful story. I haven’t read anything other than the Dark Tower series, but this story really shines as an example of King’s storytelling skills. It’s well-balanced, well-handled, and doesn’t lag anywhere. If you wanted to really look at the elements of what makes a great (and enjoyable!) short story, look no further! The second layer, Roland’s story of his youth, was also well done. That story was very interesting and very creepy at the same time. The only part that didn’t work for me was the frame story of the ka-tet, because it didn’t function as anything other than a frame. And for a book that committed to telling two stories already in their entirety, I wouldn’t have minded adding on a third. I saw one commenter on Goodreads stating that these stories would have worked really well in a book of short stories about Mid-world, Roland, and the ka-tet. I think that’s an excellent idea! We need to get a petition going for King to write such a book! Maybe with all the movie/tv stuff in the works for the Dark Tower series, maybe we’ll get another book out of it!